Last week was very eventful causing high market volatility. At the beginning of the week the pair unsuccessfully tried to break down the level of 1.3800. The rise in Euro was triggered by the statement of the chairman of German Central Bank that ECB will take measures only if inflation in EU continues. However, later European currency weakened against the USD following the speech by Mario Draghi, who said that regulator is considering options to further stimulate economy by unconventional ways. 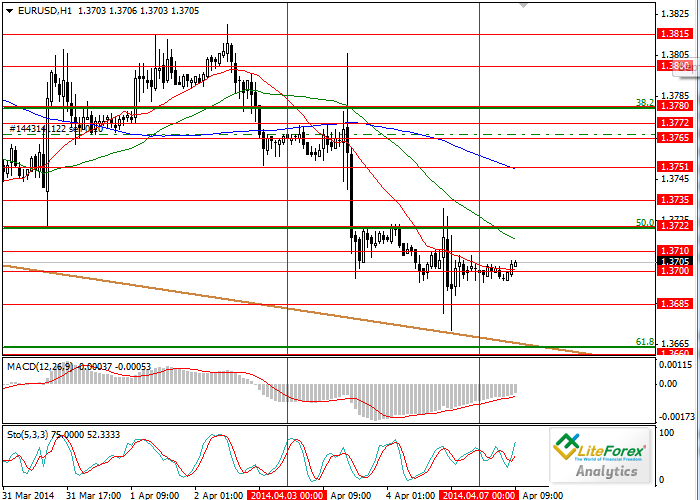 EUR/USD fell to the level of 1.3700. Last Friday the data on US new jobs outside agricultural sector became known. The index was higher than the previous month but below the forecast +192 thousand against the forecast of 200 thousand. This news has stirred the market up, however finally the pair remained at the level of 1.3700. At the moment the pair is trading at the level of 1.3700. Resistance levels are 1.3720, 1.3750, 1.3780, the latter one coincides with the level of 38.2% Fibonacci and is the main target of the bulls. Support levels: 1.3685, 1.3660 and 1.3645. Long positions are recommended after consolidation of the price above the level of 1.3780; however the pair EUR/USD is unlikely to rise higher up. Limit sell orders can be placed at the level of 1.3780.